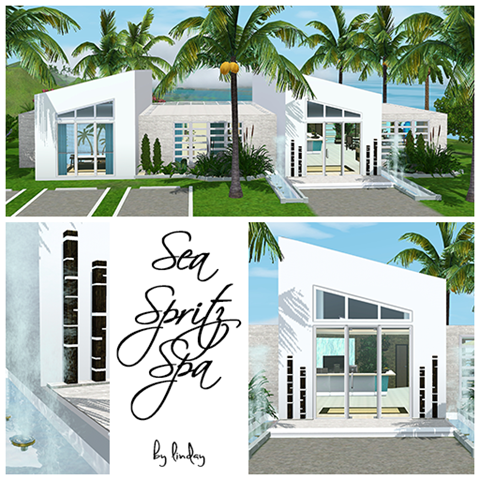 Sea Spritz Spa was built for BnS #238-239. To see the brief for the challenge, click here! The build contains a reception area, a waiting area, a tropical themed coffee shop, two massage rooms, a sauna room, a makeover room, a tattoo room, a basement pool and hot tub area, outdoors areas for relaxing and yoga, as well as parking, toilets and showers. Located in Isla Paradisio on 65 Paradise Road, the spa overlooks the ocean. No 3rd party CC, but contains items from the store, as well as from various EPs/SPs. Download from the exchange here!